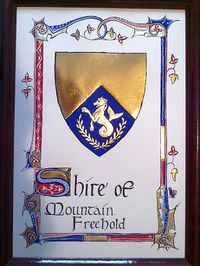 Mountain Freehold is a shire in the East Kingdom of the Society for Creative Anachronism. Freehold territory includes most of northwest Vermont. We have been around since 1978. Our members have diverse interests. There’s a lot of people doing different things, from fighting to fencing to archery to Arts & Sciences. Blazon: Per chevron Or and azure in base a sea horse erect within a laurel wreath argent. This page was last edited on 22 February 2019, at 10:34.